Which photo should I use? What photos make the best Fractures? We print all kinds of photos! We Fracture everything from professional portraits to SnapChat selfies. Anyone can make a great Fracture print! When selecting from hundreds of photos stored on our camera rolls, it can be tricky to decide on the right photo to Fracture. If you’re wondering which photos will make the best prints or debating between a couple different shots, here’s how you can decide which photos might work best for printing as a Fracture! Print what matters to you. Photography relies on capturing light. When choosing a photo for printing on glass, keep in mind that a photo that’s super brightly lit all over may print with less detail than expected. In this photo of Bella, the details in the little white strands of fur--especially at the top of her head where the sunlight is brightest--won’t be as defined as the darker portions. The finer wood grain in the upper part of the photo is also in danger of lacking detail. Mind over Monitor: A brightly lit screen can sometimes create a backlit effect to your image. A photo might look bright and glowing when viewed on a computer, but that doesn’t always translate to a printed image. Keep in mind that those brightest portions will be printed with white ink. This photo, on the other hand, doesn’t have too much contrast between the dark and light parts of the images. Since the image is dimly lit overall, it might come out a little too dim and less vivid when printed. Aha! Here’s a photo that strikes just the right balance between light and dark. The details are defined and vivid, and the lighting isn’t too bright or too dim. TIP: Zoom in on your photo to check for blur. Don’t forget to double check to see if your image file is clear. This will ensure that your Fracture print turns out crisp and defined. I can see that the important parts are still clear, even when zooming up close. It’s okay that the background is a slightly out of focus; most pictures have a varying range of focus--as long as the subject looks clear, you’re good to go! Now that I’ve picked my photo, I can upload it from the Get Started page and start Fracturing! What size Fracture should I choose? Will my photo turn out clear at a larger size? Our site will automatically warn you if your file is too small to be printed at a specific size. As long as your file looks clear up close, your Fracture will print just as clear as your original image! Check out our Guide on File Specifications for more info. As you can see, there’s no red warning symbol (*) next to any of the sizes, so this photo file (your standard iPhone photo!) is large enough to print at even our Extra Large size. Should I edit my photo before printing? There's no exact set of guidelines for adjusting color, but we recommend sRGB for the best color output (this is the default profile in most cameras). Just keep in mind that vivid, deep colors and good contrast are the best way to ensure subjects come out clearly defined! 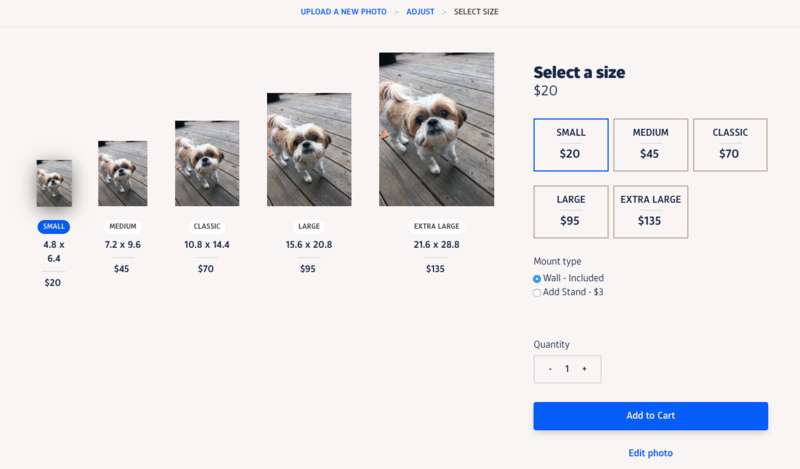 If you want to tweak a photo prior to uploading, you can adjust the brightness, contrast, and saturation in the Adjust section of our site's photo editor. For anything more advanced, we recommend a photo-editing software like Adobe Photoshop, or something similar. BeFunky.com is a good option for free online photo-editing. Never fear--we have a 100% Happiness Guarantee on every order, which means that if you’re not completely satisfied with your order, we’ll do all we can to make it right.